If you like lightly sparkling wine that is refreshing yet festive, then you just may love frizzante Pinot Grigio. With just a little bit of sparkle and light crisp flavors, this sparkling wine is perfect for festive sipping on warm summer evenings. Frizzante wines like frizzante Pinot Grigio are wines which are lightly effervescent. 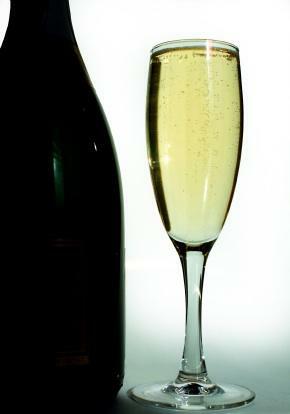 The wines have small, light bubbles which are much lighter than those you will find in other sparkling wines like Champagne or wines made using the Méthode champenoise. The light, effervescent bubbles which characterize frizzante wines come from a partial second fermentation. The result is a light fizz that is quite different from the heady bubbles in Champagne. Almost any grape can be turned into a frizzante style wine; however, there are some grapes with flavor profiles that lend themselves better to this style of wine. Common frizzante wines are Lambrusco, Prosecco, Moscato d'Asti and Gavi. Frizzante wines tend to be light, crisp and refreshing. Because of this, these wines are often preferred as celebratory wines in warm climates or on warm days where Champagne and other sparkling wines may seem a bit heavy. Pinot Grigio is a white wine made from the Pinot Grigio grape. Pinot Grigio is the Italian term for the Pinot Gris grape. In the United States, you will find wines made from this grape under both names. Pinot Grigio wines tend to be crisp, refreshing wines which have a light acidity and mild flavors. Because of the lightness of flavors, the wine pairs well with food. Common flavors in Pinot Grigio and Pinot Gris include melon, spice, lychee, pear and other tropical flavors. The effervescent frizzante style and the light, crisp flavors of Pinot Grigio suit one another quite well. By making Pinot Grigio in the frizzante style, winemakers have created a light, crisp, refreshing wine that feels celebratory without being too heavy. This style of wine is also a very affordable alternative to more expensive sparkling wines. You can find a number of Frizzante Pinot Grigio wines for under $20, with several costing less than $10. Many wine shops sell this refreshing and affordable wine. You can also find it at specialty grocery stores like Trader Joe's. Like all sparkling wines, Pinot Grigio frizzante is best served cold. To serve this wine, chill it in the refrigerator for several hours at 40 degrees, and then allow it to sit at room temperature for a few minutes before serving. The ideal serving temperature for this type of wine is between 45 and 50 degrees. At this temperature, the bubbles are at their best and the flavors of the grape come through. Serve the wine in champagne style flutes. This type of wine glass enhances the bubbles and sends them up towards your nose where they effervesce with the aroma of the wine while you sip. The light fruit and tropical flavors of Pinot Grigio pair well with light foods such as fish, seafood and pasta. The acidity cuts well through fatty sauces. It also works well as an aperitif. Because of the acidity of the grape, it is best to avoid pairing this wine with high-acid foods like citrus fruits. If you're looking for a light, refreshing, affordable and fun wine for your next celebration, try Pinot Grigio frizzante. This fun sparkler just may become your new favorite.